We are unable to schedule appointments to see any pups until Tuesday, March 6. We will have all new litters of pups available. 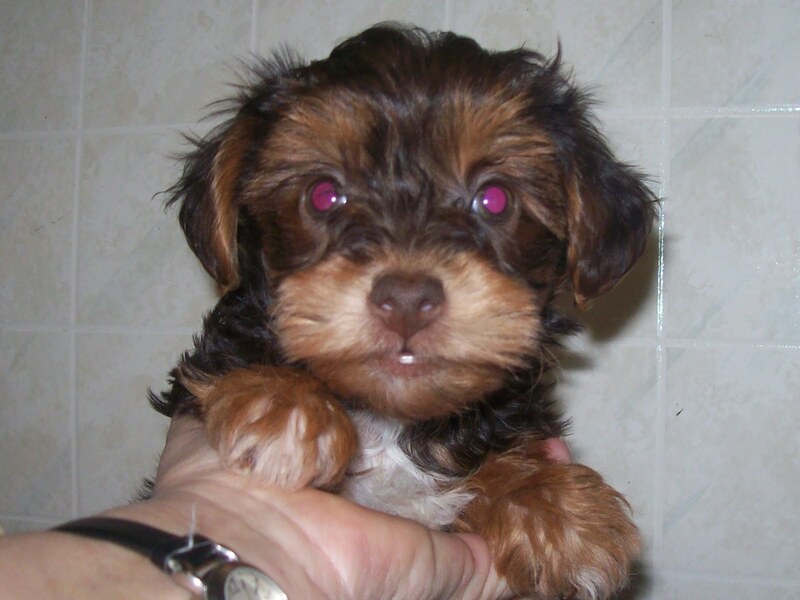 Available at that time are 1 Cavachon, a litter of Maltipoos, Shih Tzu, poodles, Teddy Bears, Schnauzers and Yorkies. Please click on the links to the right to see pictures and get more info. I will be unable to answer my phone for the next week as well. Please e-mail me or leave voice mail and I will get back to you just as soon as I can. I do have several people on the waiting list for some of the pups listed to the right, so if you have an interest in seeing them, shoot me an e-mail so that I will know to notify you to set up an appointment. Yippee for us, Yippee for you!!! We are going on a much needed R & R and need the pups that are ready for their new homes to go to their new homes. Therefore, I have put everything on sale. They must be seen and taken home by Thursday evening, February 23. You can find the particulars of the discounts on each of the breeds links to the right. So, if you are thinking that you were going to try to come out this weekend, we won't be here! We are taking deposits on the French Bulldogs. They will be ready for their new homes on March 8. 5 boys are still available. 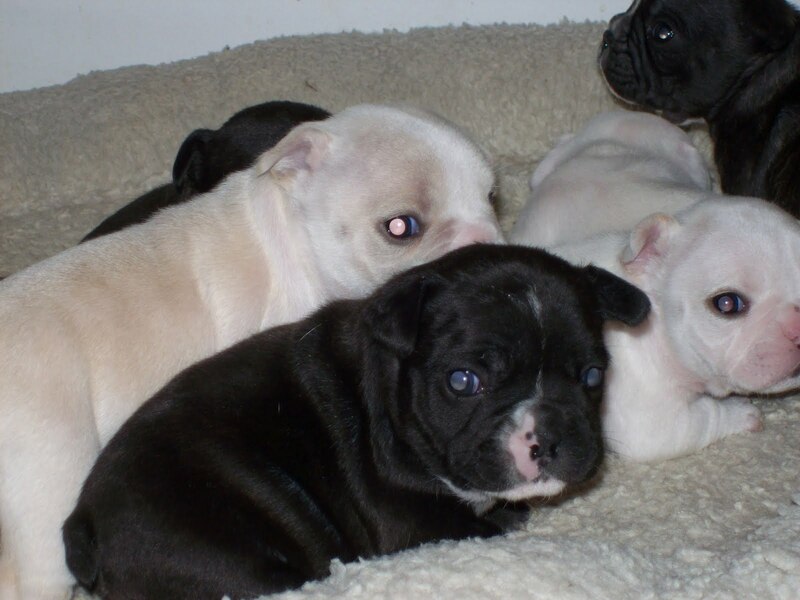 One is white, 3 are black with a little white and one is brindle. New litters of pups are available today! Got a couple of pictures of each group except for the Maltese who was not in a cooperative mood. Check the links for the information and pictures. I have decided to discount a few of the pups that are from the previous litters. That info is on each link too! Do not hesitate to give us a call with any further questions. Gave the Schnorkies a haircut today. What is a Schnorky, you might be asking yourself. Well, Mom is a Schnauzer and Dad is a Yorky. The pups look like very little mini Schnauzers, but their coat is softer. They are adoreable and have wonderful personalities. The French Bulldog pups are on the move. Only 3 weeks old and starting to toddle and when I walk in the room, they give me this tiny little bark. So adoreable. Here is a pic and I will post a little video on the link asap. We welcomed a litter of 5 little Yorkies into the world on Monday morning. Mom and babies are doing great. Next week, we will have a couple of new litters of pups ready for their new homes. Just in time for Valentines Day, we would appreciate you keeping us in mind. We will have Shihpoos, Yorkipoos, Schnoodles, Cocker Spaniels and Maltese. I will post more on their individual links.